Oklahoma’s first Rhodes Scholar — Walter Stanley Campbell (pen name Stanley Vestal) — was recently awarded a bachelor’s degree posthumously from Southwestern Oklahoma State University in Weatherford. 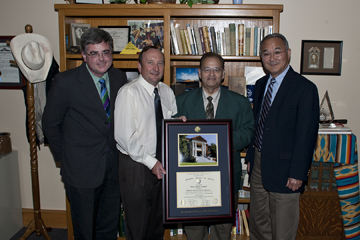 Holding the diploma are SWOSU representatives (from left) social sciences professor John Hayden, President Randy Beutler, library director Jon Sparks and Provost Blake Sonobe. In the background is a collection of books donated by Campbell’s son-in-law. Dr. Enoch Callaway. Southwestern Oklahoma State University in Weatherford has had many noteworthy events during its 110 years of existence but one little known fact is that a member of the school’s first graduating class was also Oklahoma’s first Rhodes Scholar. Walter Stanley Campbell, also known as author Stanley Vestal, was a member of Southwestern Normal’s first graduating class. He was the stepson of the university’s first president, James Robert Campbell. Due to political issues, Southwestern’s degree-granting authority was suspended for a short time in 1908. Thus, Campbell never received an actual degree from the institution. Current SWOSU President Randy Beutler wanted to correct this and he, along with Provost Blake Sonobe and Vice President Tom Fagan, initiated the process of awarding Campbell his degree posthumously. Campbell was born in 1887. His father, Walter Mallory Vestal, died while Stanley was a young boy. His mother, Isabella Wood Vestal, later married James Robert Campbell, who eventually became president at Southwestern. Vestal’s legal name became Walter Stanley Campbell. Years later, however, when he began to write, Walter Campbell needed a pen name and he adopted his original name, Stanley Vestal. While at Southwestern, Vestal played football and taught literature courses when the head of the English department was on leave. In 1908, he sailed to England as the first Rhodes Scholar from Oklahoma. He entered Merton College, Oxford University, to read in the Honours School of English Language and Literature. After three years at Oxford, he received a bachelor’s degree and completed the basic requirements for the master’s, which was awarded in absentia in 1915. In 1911, Campbell returned to the United States, where he became an English teacher in Kentucky. That lasted one year because he wanted to be free to write. Campbell returned to Oklahoma, and began a serious study of the Plains Indians, whom he loved and admired. In 1915, he sought and received an appointment as an instructor in English at the University of Oklahoma, where he stayed until his death in 1957. During this time, he wrote many books on the Southern Cheyennes and Arapahoes, Kit Carson, Sitting Bull, other Indian tribes and the West. Today, historians generally turn to Campbell’s works not as sources in Western history but for apt characterizations and incidents in Western history. SWOSU recently received a donation of 25 books from Campbell’s personal library. The gift came from his son-in-law—Dr. Enoch Callaway.